Innovation in Education - what is it? I am lucky enough to be chosen to do a short TED style talk at the upcoming IB Heads of Schools World Conference in Singapore. I am presenting on innovation and how IGBIS is implementing an Innovators Mindset. Before I started writing (or talking) I wanted to get a good working definition of what is "Innovation in Education"
I started by re-reading George Couros' excellent book "The Innovators Mindset" reading it again has reminded me of some of the excellent ideas I have forgotten and some things I have missed the first time round. I love George's definition that innovation is a mindset, a way of thinking and that innovation has to be better, it is not good enough to just have or do new things, these new things have to make education better. To broaden my perspective I asked my PLN (Personal learning network) via twitter how do they define innovation, I got some excellent responses. 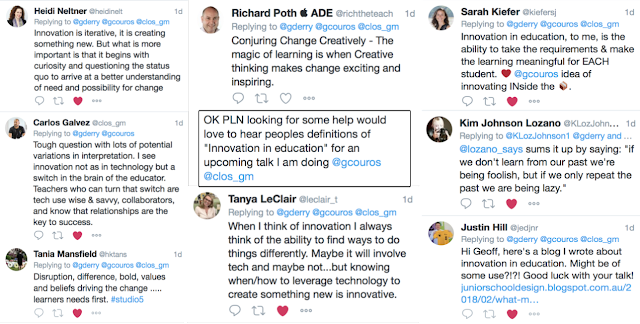 I love that most of the replies I received included the concept that innovation in education is more than something new, it is more than the technology; it is creativity, change and taking into account the learners needs. Next I asked the staff with a quick one question Google Form. I got 12 responses but reading through those responses, they were pretty good. 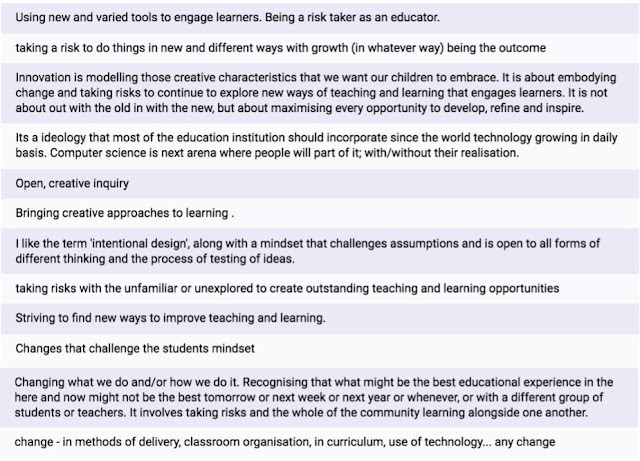 Once again the topics of creativity, change to benefit the learners, improvement and because we are an IB school "Risk Taking". AT IGBIS we are lucky to have educators with this innovators mindset, it is not about all the cool toys, gadgets, computers, iPads, subscriptions and resources. It is about what we are doing with them. Sure it is cool to have VR headsets, students can participate in virtual field trips using Google Expeditions or visit landmarks using Google Street view, but we don't want to fall into the trap of doing the same old things in new ways. That is why we are exploring student creation of AR and VR experiences, taking these cool new tools and toys to the next level. We have students in kindergarten using Panoform to draw their own VR scenes, older students are using the same app smashed together with Quicktime to create 360 movies of scenes they have drawn. We have students creating AR experiences using Metaverse for other students to revise mathematics or to provide younger students a fun interactive way to check their comprehension. We are also using roundme.com so that students can create virtual school tours or virtual art galleries where students work, reflections and and creation videos are shared in a 360 environment. The best thing is that because of our innovators mindset, this is only the tip of the iceberg (so to speak) we will have lots of new and improved learning opportunities for our students constatntly being trialled and developed.